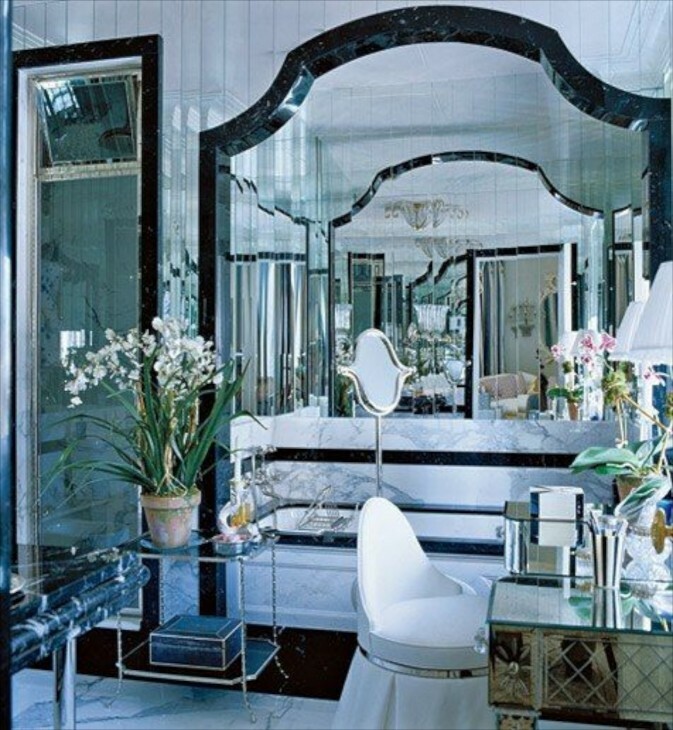 What makes a design style glamorous? For sure it is highly stylized, decidedly of a feminine bent, all the while remaining sophisticated. Ahh, glamorous takes it even one step further. It adds an exciting quality that makes a room seem extra special. When we think glamour we often think Hollowood……..sequined gowns perhaps, glittering jewels. When we think of glamour the word luxury often comes to mind. Upscale, shiny, gleaming or posh. Together they create an environment that is definitely luxurious. It is often thought of as a whimsical style, one that beckons us to retreat to, a place to pamper ourselves . Why whimsical you might ask? Because it is where we can create a place that is more fantasy than the reality we often find ourselves living in. Kids, a husband, pets…… our femininity often becomes muted, placed on the back burner, or forgotten. I often think longingly about a room where I can be a total girly girl. Glamorous is refined, not extravagant or gaudy – a fine balance that teeters on excess, and I think one of the most difficult to design. It creates the illusion of a pampered yet refined Lady living there. 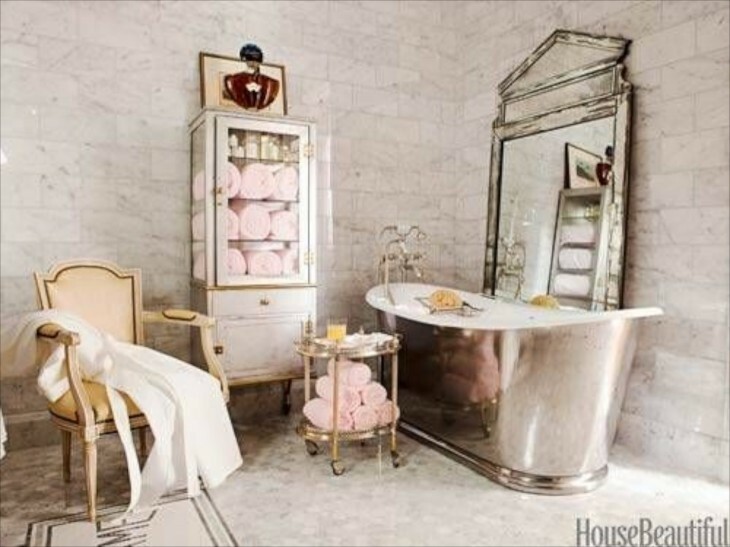 So what pushes decor from elegant and sophisticated to glamorous? 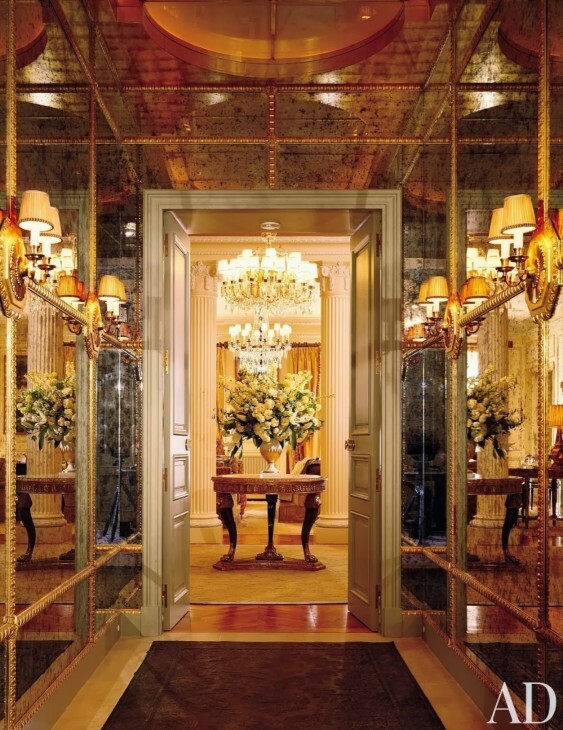 Usually high end furniture and decor, particularly statement pieces such as lacquered or mirrored. Elegant color schemes using neutral colors with shimmery finishes or details. Lots of tone on tone, metallics, sharply contrasting prints and patterns for contrast. 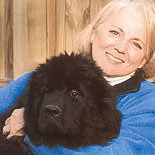 Fabulous and luxurious fabrics such as silk, satin, velvet, and soft woolens, faux fur perhaps. The total look is almost understated yet obvious. It can’t be totally glamorous without crystal, in a vase, or best of all, in a chandelier. Let’s look at some rooms and after, do tell if this is secretly your style. 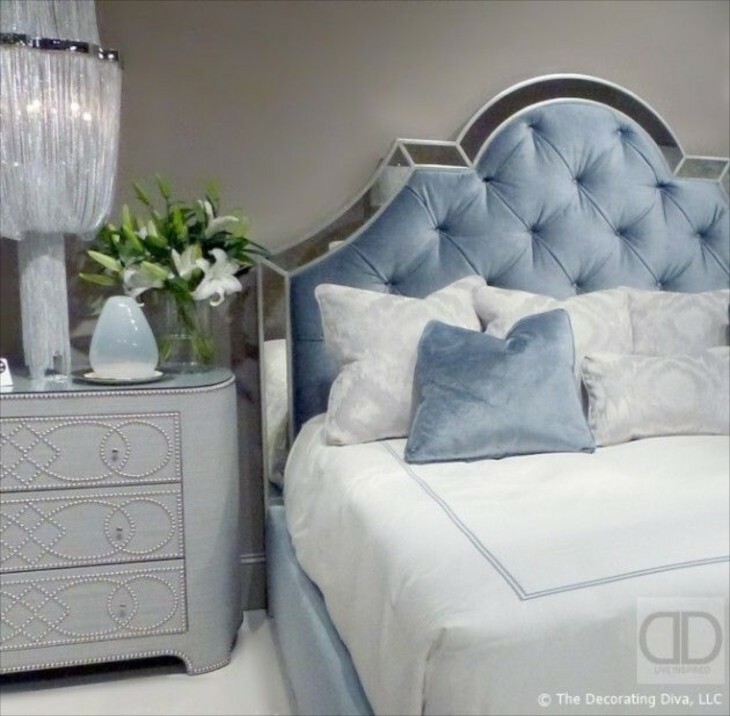 This one has almost all the elements ……silk, tufted headboard, reflective surfaces, feminine colors and more. 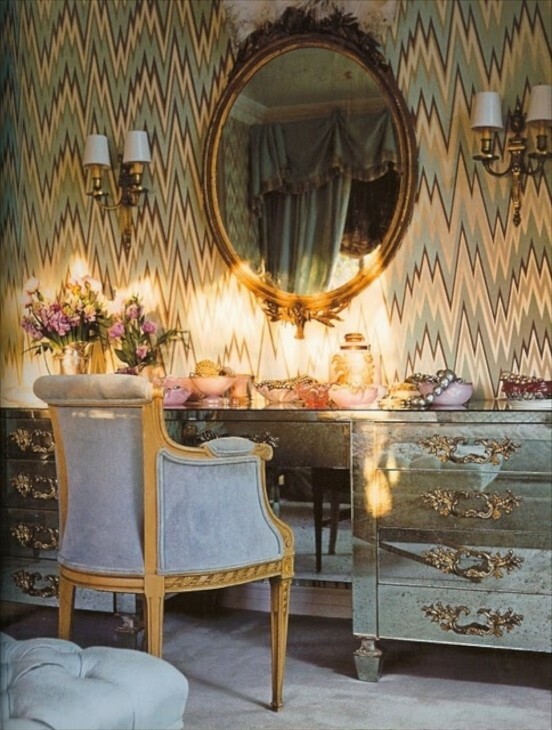 Glamor in the dressing room…..love the green chandelier. 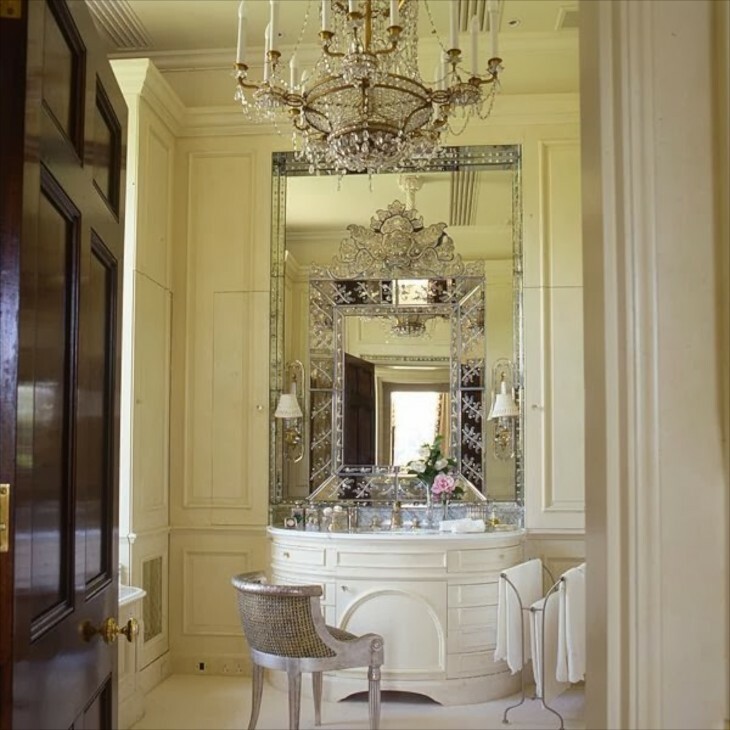 Venetian mirror on top of a venetian mirror, crystal chandelier…..ultra feminine. This is one of the few kitchens I have come across that attains quite a feminine feel. 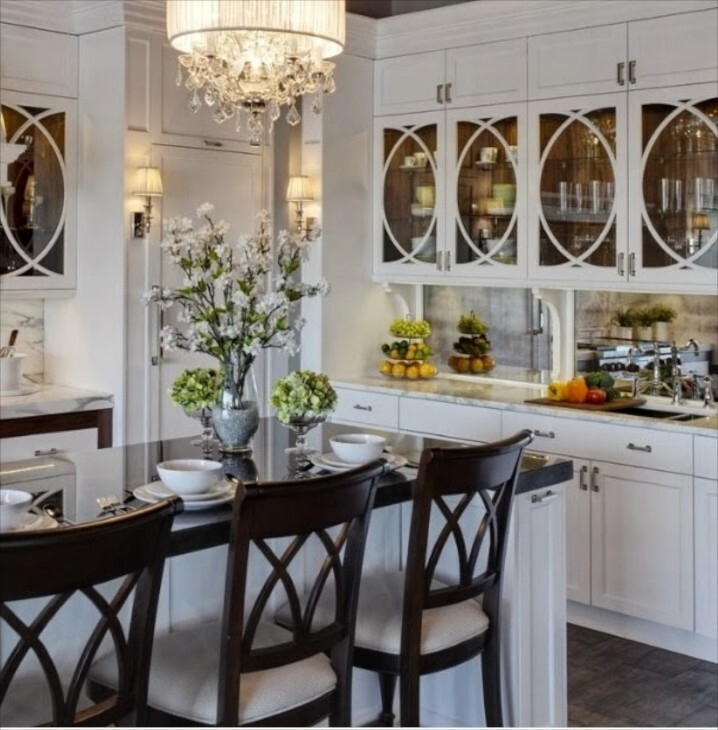 Sophisticated and kicked up a notch to glamorous by the chandelier, the shape of the glass door dividers, and the antique glass backsplash. Sconces set on antique mirrors floor to ceiling and beautiful metallic architectural detail trim dividing the mirrors into sections. High style. Girlie, girl. 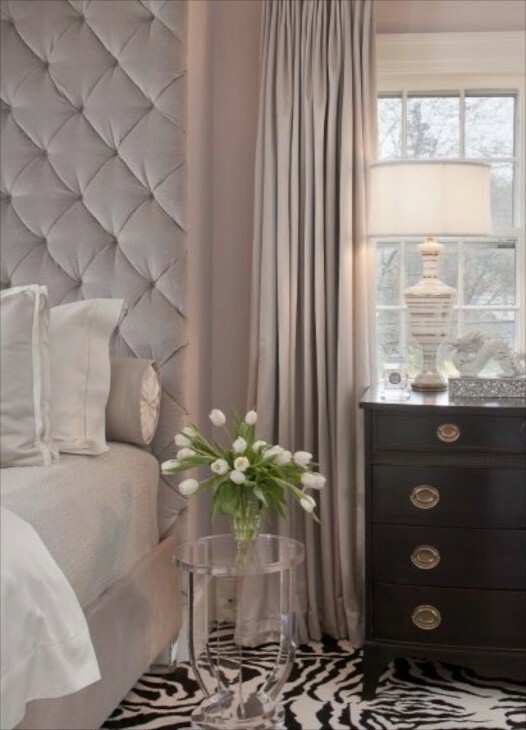 The beveled mirror trim on the tufted headboard is the added detail that makes a difference. The velvet headboard fabric continues along the side rails and the linens set the tone. How about that bedside lamp? 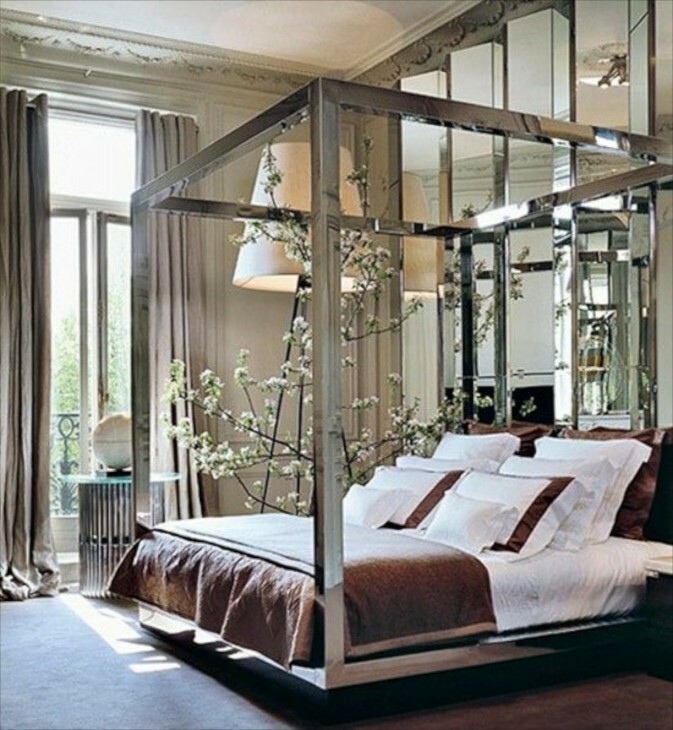 Can you find all the elements are that bring this bedroom to the level of glamorous? This is a bedroom that the longer I looked at it, the more I liked it. The bedside floor lamp is amazing. It is not only glamorous but chic with the combination of old world and modern. Take a look at the beautiful cornice moldings along the ceiling. 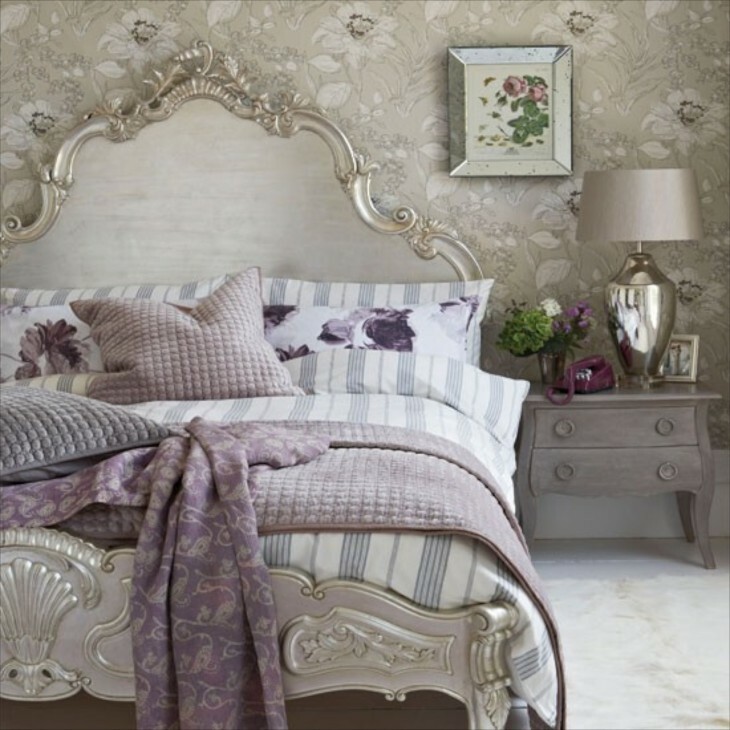 Luxury fabrics on the bed and in the draperies….. 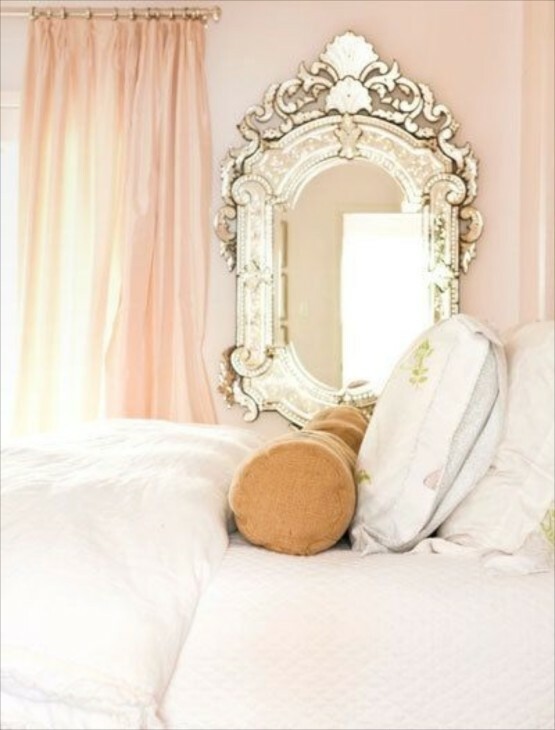 The mirror and pale pink color. Glam is quite achievable even on a smaller scale. Sophisticated and glamorous. The headboard goes to the ceiling for emphasis. The clear lucite table can substitute for mirrored surfaces. Don’t miss the glitz on the night stand. 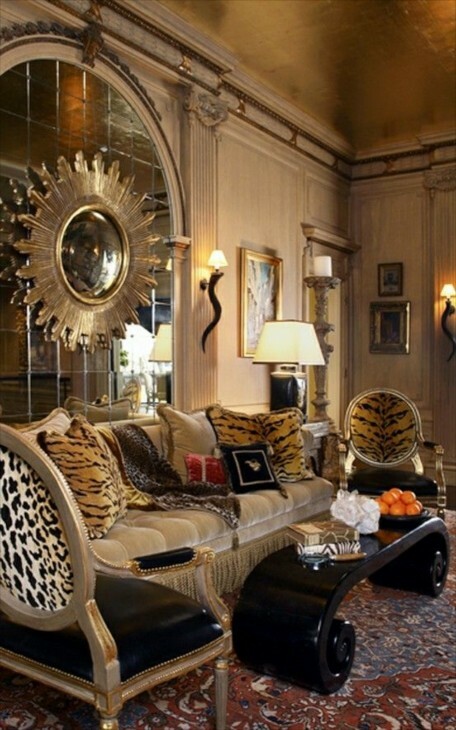 Using faux animal patterned rugs such as the zebra one here is another way to add the glamorous details. All feminine yet softly glamorous. The detail trim on the mirror makes a difference in the wow factor. 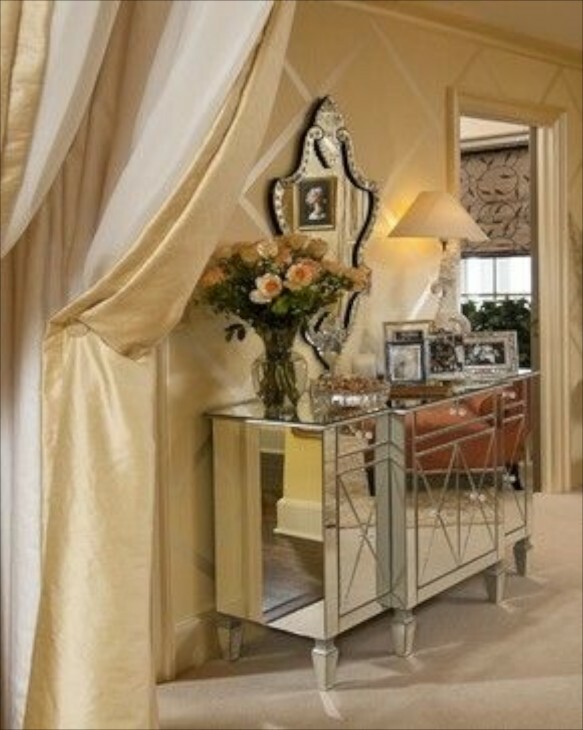 shiny surfaces on the chest, the walls and the drapes….all very luxurious. I hope you have noticed that flowers are present in almost every photo and add to the feeling of luxury and comfort. 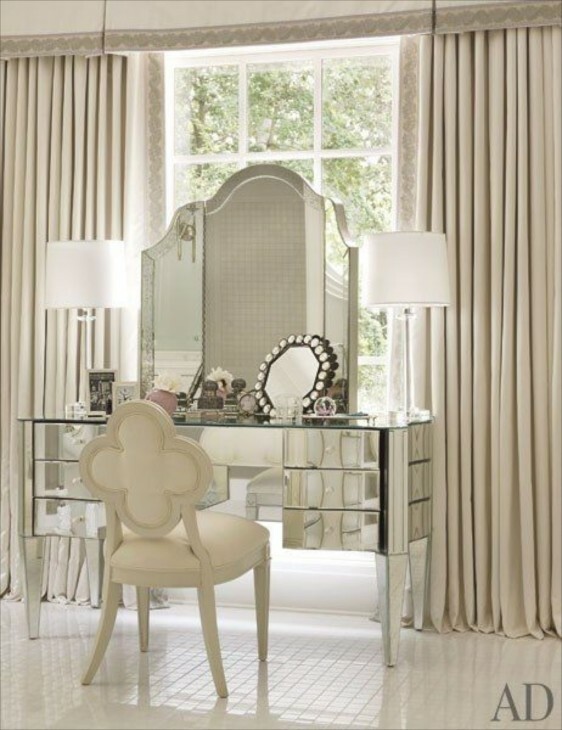 Even a tailored look can rise to the level of glam, such as in this very feminine space. Really like the choice of the chair shape, whimsical and a lovely contrast to the straighter angles of the vanity legs and the formality of the drapery pleats. 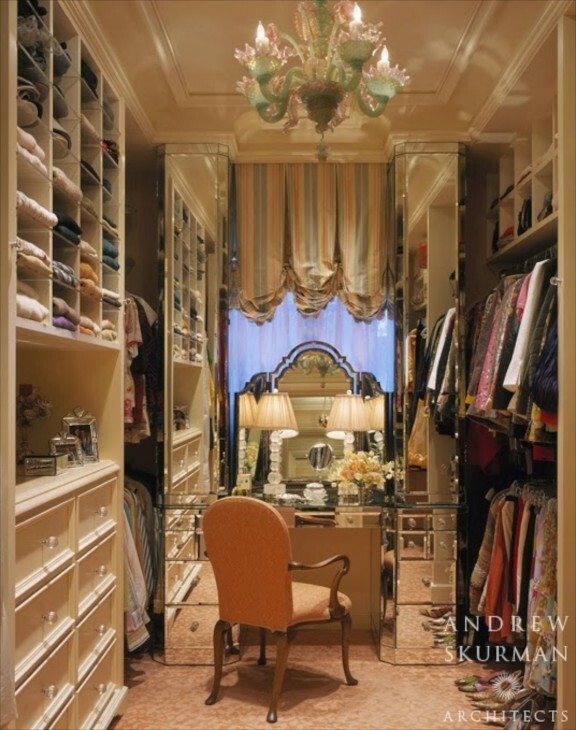 Notice the same chair as above is used in a purple fabric for this amazing dressing room. The mirror is fantabulous and the ceiling provides geometric pattern as does the rug. I would have added two slightly larger crystal chandeliers (adding a bit more bling) to hang in place of the tiny ones already there. I almost missed them! Speaks of a bygone glamor……lovely. 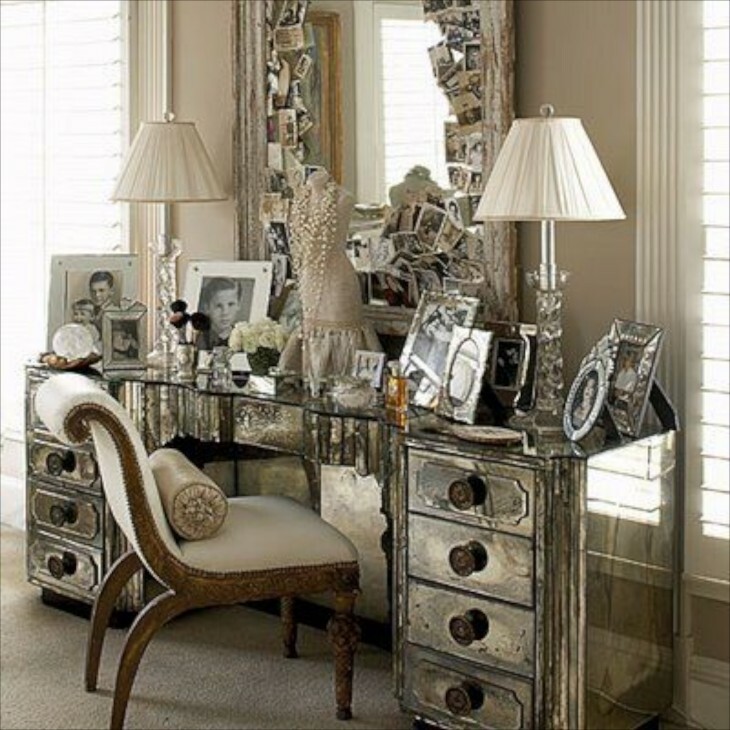 The photos on the table and around the mirror is so old Hollywood glamor. I can just imagine Audrey Hepburn or Lauren Bacall sitting there. 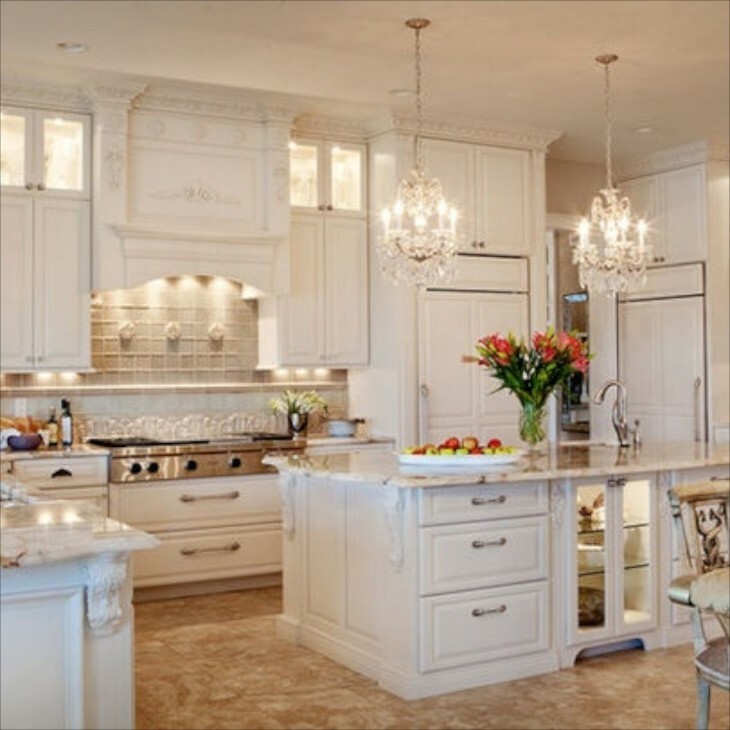 A kitchen that is made glamorous by the hanging chandelier and high cabinets with ornate trim. Reflective stainless and nickel finishes and high end surfaces. 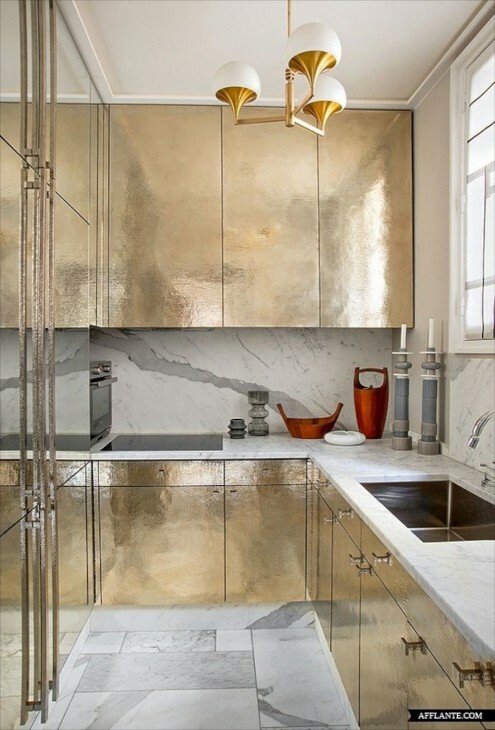 I debated about this one, because I didn’t think that the choice for the chandelier was glamorous enough for the hammered metal cabinets, which I adore. But it was a close call, so I left it in. The use of amazing mirrored surfaces in elegant shapes in the tub alcove, crisp black and white contrasts and very upscale furniture and surface choices make this bathroom a luxurious retreat. Here again we see the use of contrasting black and white with a crystal chandelier to create glamor while still clearly feminine. What can I say here……gentleman, this is for ladies only. Love the ceiling and the lacquered and shiny black surfaces of the chair seat and the sofa table. Here the use of a pale blue as a background for a combination of gold and silver metallic and reflective surfaces does a beautiful job of creating a glamorous space. The geometric wallpaper for contrast is perfect. Even in a child’s room we can set a tone for glamor. 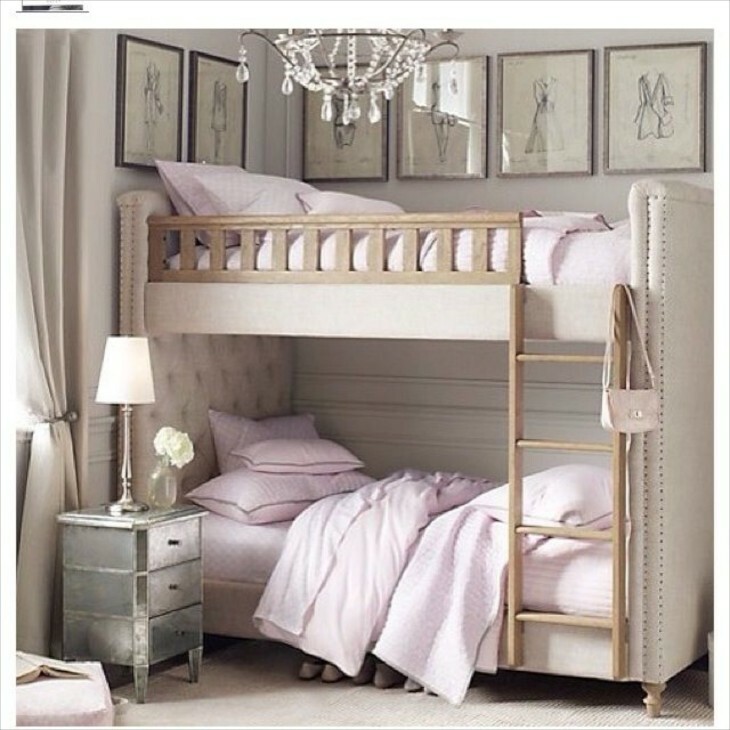 Framed fashion prints on the wall, pink color, chandelier and tufted fabric bunk beds with nailhead trim….WOW! The sweet silver night stand is a perfect addition. The only thing I would have changed is the ladder and rail color. Ladies, shall we enjoy a cocktail in the living room? Check out the pale pink barrel vaulted ceiling! This room is a sophisticated delight. Thanks Victoria. How lucky you are to have your own special room, thanks to Robert. I have a lot of square footage in this home, but each has a specific “other” and necessary purpose and alas, I haven’t a space just for a glamorous room. That will change however! Enjoy your weekend.